It is the technical term for your website to gain a position in the search engines (namely Google as it has 80% of all searches performed throughout the world) for a particular keyword. For this to happen your website must be both ‘on site and off site optimised’ for that keyword. If you can get onto the front page of Google for a search term or keyword that relates to your business, you can drive literally thousands of customers to your website. Shown below is a diagram of how your website could appear on the front page of Google for your chosen search term. The PPC box is the pay per click advertising and the SEO is the “free” advertising where you do not pay Google, but the work involved to get you to that position. This can be very time consuming, and someone has to be prepared to spend that time working on SEO for your website. Frank Comms can carry out this work for you at a monthly cost from just £300 – £500 with very concise reports, depending on the competitive arena you work in. > Write content that uses phrases & words that will be used by people who search for your product. > Build links to your pages to show they are of great significance. And you got it – Keep doing it! Search Engine Optimisation or SEO is the simple activity of guaranteeing a website can be found in Search Engines for words and phrases appropriate to what the site is offering. It’s simply quality control for websites. Search Engine Optimisation should allow the hundreds of robots crawling the internet to know EXACTLY what your site is about and how important it is to display it as a perfect match, when someone is looking for your type of business. 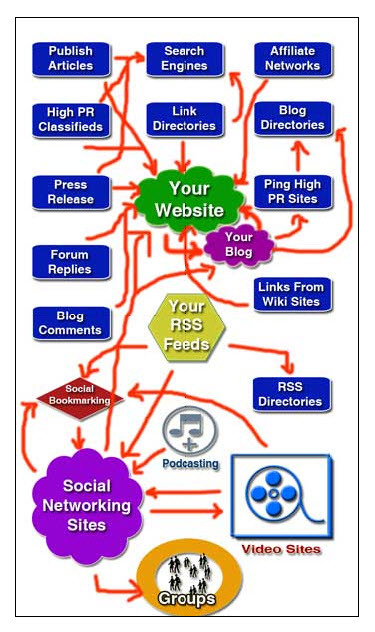 A typical set up for a site that is SEO friendly might look something like the diagram below. SEO might seem an expensive cost, but not if you are serious about how much the internet can do for your business. LOOKS COMPLICATED? – Don’t worry we can help make it simple. How Can We Help with Search Engine Optimisation? 1. We will help you identify keywords (search terms) that are being keyed into Google relating to your business where the competition is beatable. We use state of the art tools to help you beat your competition. 2. Once we have both agreed on the unbeatable search terms we will begin optimisation both on site and off site and send you a monthly report. 3. Each month we will send you a monitoring report showing your position in Google, Yahoo and MSN. Ask some SEO companies about SEO and they’ll try and blind you with science and confuse you. Frank Comms is different. We want you to get it! If you’ve never used an agency before, it’s quite simple – just tell us who you want to target, when and where, and let us put a media schedule together for you – our advice is FREE. “Mel Sims at Frank Comms is an agency professional who always acts in the best interests of her clients, is a keen negotiator whilst fully appreciating the value of proven trusted media. Mel is also quick to run with new ideas and opportunities across all new digital platforms. She is valued friend and is a pleasure to work with”. – Christine Meah, Edusentials Ltd.
© 2018 Cost Per Response LTD trading as Frank Comms.